Bacteria display remarkable plasticity by exploiting mechanics in response to locally changing physical and chemical conditions. Compliant structures usually assist their taxis behavior to navigate inside complex and structured environments. Bioinspired microbiological mechanisms contain rationally designed architectures capable of large, nonlinear deformation to introduce autonomy into engineered small-scale devices. In a recent study, H.W. Huang and colleagues in the departments of mechanical engineering, applied mathematics and theoretical physics, analyzed the effects of hydrodynamic forces and rheology of local surroundings on swimming at low Reynolds number. In the work, they identified the challenges and benefits of using elasto-hydrodynamic coupling in locomotion to develop a suite of machinery to build untethered microrobots with self-regulated mobility. The scientists were able to demonstrate coupling between the structural and magnetic properties of artificial microswimmers with the dynamic properties of the fluid, during adaptive locomotion in the absence of on-board sensors. The results are now published in Science Advances. Microorganisms contain diverse machinery for molecular motion to effectively navigate complex environments and ecological niches. In bacteria, swimming arises from the mechanical interactions between the actuated flagella, cell body and the drag generated by the flow. Viscous forces at low Reynolds number are responsible for hydrodynamic drag, which in turn depends on the shape of moving objects. To optimize their motility, bacteria can adopt alternate shapes and sizes during the course of their life cycles. In addition to changing body shape, bacteria can also use propulsive systems for advanced motion in complex environments. For example, by bending a hook Caulobacter crescentus can enhance motility, while Vibrio alginolyticus can outperform multi-flagellated Escherichia coli in climbing nutrient gradients due to flagellar buckling instability. Furthermore, Shewanella putrefaciens can escape physical traps via a polymorphic transition in the flagellar filament. Microscopic artificial swimmers that researchers developed via bioinspired microengineering to move through bodily fluids, across biological barriers and access remote sites of disease could revolutionize targeted therapies. Pioneering work in the field has already demonstrated the feasibility of mimicking the prokaryotic or eukaryotic flagellum to build magnetically controlled microswimmers with nonreciprocal motion. However, unlike living cells, these mechanical devices cannot sense their local environment or adapt to changes in physical conditions. Controlling artificial materials can pave the way to build tunable, durable and robust engineering solutions such as autonomous biohybrid robotic devices. In the present work, Huong et al. introduce a simple and versatile method based on materials fabrication to engineer magnetically controlled soft micromachines. The concept is based on a 3-D reconfigurable multibody system engineered from a nanocomposite hydrogel monolayer. In previous work conducted by the same research group, Huang et al. detailed the form and magnetization profile of self-folded micromachines in which structures could be independently programmed by incorporating magnetic nanoparticles (MNPs) into patterned hydrogel layers. For this study, the scientists presented a set of design strategies to self-regulate motion and maneuverability via the interplay among viscous, elastic, magnetic and osmotic forces. Huang et al. demonstrated that the reconfigurable body could continuously morph according to the surrounding fluid, enabling movement through constrictions for enhanced locomotive performance. They showed that elasto-hydrodynamic coupling in shape-shifting and gait adaptations could allow microbots to navigate inside obstructed, heterogenous and dynamic environments. Role of body plan on maneuverability. Helical microswimmers showed the best performance as expected because they do not deal with body and tail coordination. Credit: Science Advances, doi: 10.1126/sciadv.aau1532. Huang et al. engineered the soft microswimmers using bioinspired locomotion with a variant of origami known as kirigami. The compliant 3-D microstructures were designed from a thermoresponsive gel reinforced with MNPs (Magnetic nanoparticles). During the process of fabrication, the scientists initiated cutting via photolithography and folding upon hydration of the polymerized layer. The nonuniform distribution of MNPs along the thickness direction allowed the formation of two distinct layers of hydrogels with significantly different swelling ratios. The researchers focused on three microorganism configurations, including C. crescentus, Helicobacter pylori and Borrelia burgdorferi. The bacteria typically swim by rotating propeller-like flagellar filaments that extend from the cell body. Biomimicry of the motion could allow artificial microswimmers to move, if the magnetic moment of the machine was perpendicular to its long axis. However, the structures resembled compass needles instead, by aligning their long axis to the direction of the external magnetic field. To overcome this limitation, Huang et al varied the out-of-plane alignment of the innate MNPs in the material, while keeping the in-plane particle alignment constant. Dynamically recording the magnetization profile. Magnetically reinforced nanocomposites were in a direction other than the direction of MNP alignment. The applied field was significantly higher than the magnetic field applied to align particles during fabrication of the microbots. Credit: Science Advances, doi: 10.1126/sciadv.aau1532. To optimize motion at different viscosities, the microstructures acquired different gaits. To systematically explore the potential advantage of morphological diversity Huong et al. built microswimmers with different body plans and actuated them in fluids with varying viscosity. The scientists were able to engineer microswimmers that followed 3-D helical trajectories by coordinating their morphology with their magnetization profile. In all experiments, the Reynolds number ranged from 10-2 to 10-4; to indicate swimming under laminar flow. 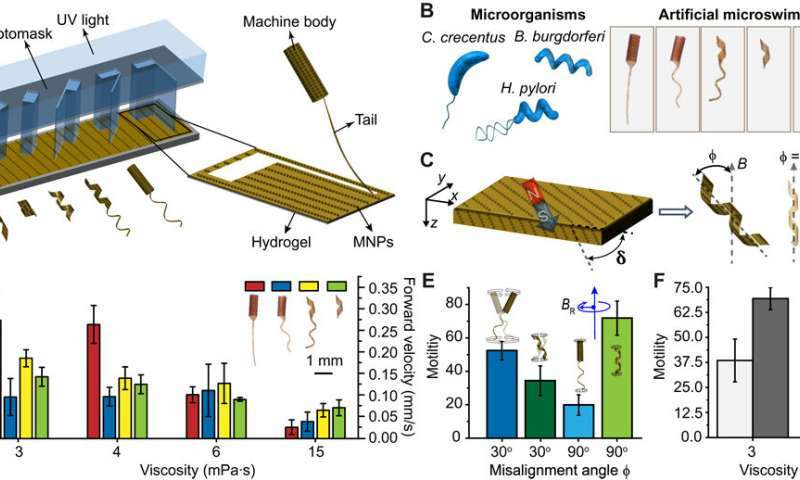 In a solution of sucrose with the same viscosity as blood, the flagellated microswimmers with a flexible planar tail and tubular body moved faster by helical motion compared to other prototypes. Flagellated microswimmers benefitted from both helical and corkscrew motion, while helical microswimmers performed corkscrew motion. However, during increased viscosity the motion of all microswimmers decreased, but the drop was highest for flagellated microswimmers with a planar tail. At higher viscosity, Huong et al observed that helical microswimmers were the fastest, as the only relevant motion under the conditions was corkscrew motion. Alongside motion, the ability to regulate motion (maneuverability) plays a key role in bacteria to sense and detect nutrient gradients. The scientists tested the maneuverability of artificial microswimmers by inducing deflections in the yaw angle (rotation) during swimming. A highly maneuverable microswimmer could change its direction of motion quickly with a small change in the control signal. During stronger perturbations (45-degree yaw rotation) both body and tail geometry played an important role in the response of compliant microswimmers. Structurally, the body responded to the control signal before the tail, since magnetization of the body was higher. Swimmers with a planar tail showed higher susceptibility to instabilities, a helical tail could comparatively contribute to stabilization due to higher stiffness of the helical geometry. Shape adaptation in curved channels under axial flow with a rate of 2 ml/min. The observed deformation was elastic, and swimmers completely recovered their shape after passing through the corner under the externally applied flow with a rate of 2 ml/min. Increasing the stiffness of the filaments reduced deformation and led to obstruction of the channel. Credit: Science Advances, doi: 10.1126/sciadv.aau1532. The scientists prepared tubular machines to explore the combined effect of body size and viscosity on maneuverability. They were able to dynamically re-magnetize the body to provide a method to adjust motility and maneuverability on demand. They found that a smaller body size provided comparative advantage by lowering rotational drag and increased magnetic torque, regardless of the viscosity. Huong and co-workers determined the propulsion efficiency of compliant swimmers by coupling between the magnetic forces, filament flexibility and viscous drag. They investigated the elasto-hydrodynamic properties to trigger a gait transition in response to changing viscosity. The scientists observed coiling of the microbot tail at higher viscosity and frequency. The observed morphological transition or transformation, contributed to corkscrew motion for enhanced microbot motility. Gait adaptation of tubular microswimmers with an elastic tail. Elastohydrodynamic properties can be exploited to trigger a gait transition in response to changes in low and high viscosity. Credit: Science Advances, doi: 10.1126/sciadv.aau1532. Based on comprehensive strategies of motion and maneuverability, the data obtained in the study revealed that a tubular body with a planar tail was preferable to swim at low viscosity. Comparatively, a helical morphology could perform better at higher viscosity. Huong et al. constructed a magnetically reconfigurable microswimmer to undergo shape transformation between the two configurations based on external conditions. The programmed microswimmers could change shape for sustained forward velocity and enhanced maneuverability despite increased viscous forces. In this way, careful analyses of swimming performance at varying viscosities provided a guideline to build a single micromachine. To solve the navigation problem at the micro/nanoscale, Huong et al. reduced the number of elements to be controlled for the resultant advantages of speed, versatility and cost. The microbots can be manufactured via high throughput and scalable methods to open doors for the development of a range of soft microrobots for medical and industrial applications.